I'm trying to figure out where to park for five days at or near Chicago's O'Hare Airport (Terminal 5). I know there are on-airport parking lots E, F, G which are conveniently accessible to Terminal 5 via ATS train. Cheapest of which is lot F at $9/day, but it requires taking a bus to the ATS train. The google search results for o'hare parking are a mess of ads. I did find some options including private economy lots listed here (if their shuttles even stop at terminal 5, you have to call them, not a huge deal but less convenient). The best reviewed off-airport spot I found was http://www.yelp.com/biz/preflight-airport-parking-schiller-park, it's $6/day but we have to call to get a shuttle to Terminal 5. 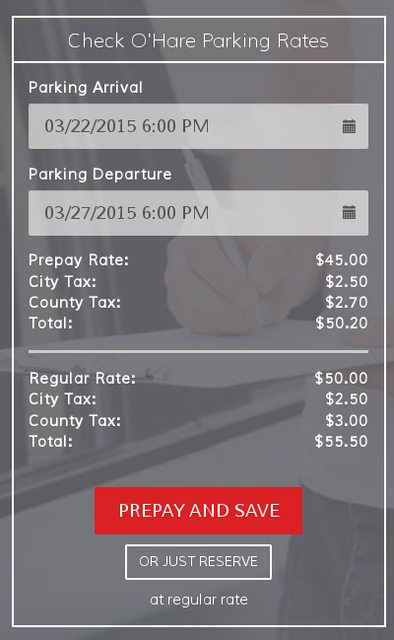 Where can I park for under $10/day that has the easiest access to Terminal 5? Parking around Chicago O'Hare Airport seems to be a highly requested service, considering the number of options that can be found on the web. The reason behind this is probably due to the lack of convenience of having to catch a train from the economy parking lots to the terminal, or to the lack of cheap (≤q; 10$/day) parking spots. To be fair, convenience has a price. Therefore cheap convenient parking is probably somewhat of an oxymoron. For completeness sake, I just discovered SpotHero, which is a mapping tool which can be used to locate parking spots by geographical position. Using O'Hare Airport, Chicago, IL as a search term yields the following map of results. Aside from the airport parking, the rates retrieved by SpotHero seem to be oscillate between 8$-10$/day. Most of the services offer shuttles to/from the airport. All in all, the results of these searches show that there are plenty of parking options in and around Chicago O'Hare Airport. Indeed, owning parking lots seems to be a very profitable business in Chicago. Prices across different services might vary by a few bucks but generally speaking they are all similarly equipped: 24h access, shuttle to/from the airport, car wash service, etc. Having said this, convenience and cheapness are somewhat subjective parameters. It will therefore be up to you to pick the option which suits you better. Not the answer you're looking for? Browse other questions tagged airports automobiles long-term chicago ord or ask your own question.